To keep the body healthy, we need on daily basis fresh air, water, food, hard work, sleep, rest, and laughter. Laughter is a daily chore we need to perform. It is the dawn of the life. Through laughter the mind becomes lively, the face starts to glow, looks and attractiveness increase many folds. Laughter is of many types like, smiling, hearty open mouthed laughter, laughing while clapping and laughing while tossing around, etc…. The body is activated by laughing. Many problems arise in life, and if you face them laughingly then, half of them get solved immediately. In reality, who so ever learned to laugh will make friends because all like jolly person. The stomach, lungs, and liver are exercised by laughing. The energy gets generated while laughing. The body receives more amount of oxygen thus energizing the blood; the foul carbon dioxide is thrown out. The mental tension gets reduced on laughing or smiling. Through experience we learn that laughter can improve body’s fight back system, improve blood pressure, stimulate the organs and reduce pain? The blood circulation increases thus making parts of the body stronger. The hysteria and depression get over. Laughter is a definite cure for anxiety and worries as it enhances the mental and bodily capacities. The Japanese teach their youngsters to laugh a lot. While young children get training to remain happy and disease free by laughing and smiling. 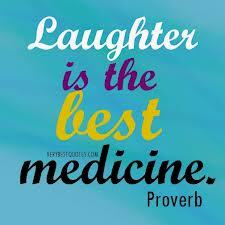 Laughing not only improves the health, but it is the panacea of staying healthy. The laughter makes the life accomplished and energizes the mind and body. Competition in 21st century has wiped out smiles on the face of human beings thus making victim of diabetes, high blood pressure, insomnia, migraine, That’s why they say keep smiling and remain healthy. Shakespeare wrote in his stories that laughing increase the longevity. That remaining in humorous mental condition the life gets prolonged. One should always indulge in laughter, so that smile is louder which reflects happiness and love.